How Host A Poker Tournament at Home? These days, it’s quite frequent for people to throw Poker Tournaments in their house; however, it wasn’t until last week that I was invited to one and enjoyed the amateur and fun environment of one of these events. As usual, I was asked tons of questions that seemed logical, yet they weren’t to many of the players. It got me thinking that I could write a post on how to throw a Poker Tournament at home with the standard and professional guidelines that tend to be crucial to many people. Hey, the more professional your reunion is, the better. It’s not only a lot more fun, but it helps have a more fluid and stress-free time where everyone feels safe, especially if there’s money involved. As you may know, currently the most popular form of home poker games popping up these days tends to be single-table tournaments, which makes sense since they generally have a set length of time, so you don’t need to play until dawn to determine a winner. Normally, these games start with three and 10 players and play like regular Texas Hold’em with escalating blinds. The tournaments go until one player has all the chips. We are assuming that everyone invited to a Poker Tournament know how to play Poker, so I won’t be talking about that. What I noticed was the biggest problem at the home-run poker tournament that I was invited to, was the lack of a tournament clock. And people, this is all that you basically need to run a successful tournament. This is it! Why? In many home events the blinds go up at random intervals, or don’t go up at all. This leads to tournaments dragging on and it may even create a tired and stressful environment. There are many ways in which you can get a tournament clock. Go online and use one of the many free clocks offered to be used for free. Also, you can always get one that you can keep at home for future events. It’s important that you know how to use the watch, so here are some tips. Adjust all the general details. Give your tournament a name. Select how many players will be playing and enter the cost (entrance fee). Select the starting stack. A good starting stack will start the tournament off with 100 big blinds. The first level is $25/$25, so why not make your starting stack $2,500? Select how long you want the tournament to run. 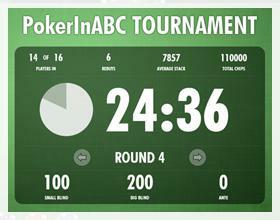 Once you select the duration, the tournament clock will automatically update the level times. Last but not least, select what kind of payout structure you want. It will automatically adjust for the price of the buy-in! When you are ready to go, hit the play button and your tournament is under way. No more guessing about when to raise the blinds or what the next level will be. As the tournament progresses, you can also adjust the clock eliminating the players that get knocked out. It will then update the average stack section. The tournament clock handles everything for you. All you have to worry about is making sure everyone at the table can deal the cards and voilá!